Thanks - can you let me know what phone model/OS you’re using as well? Video of OTA2go settings and another attempt to download. Thanks so much for all of this detail. Really appreciate all of your effort. Interesting that in the most recent video it uses ota2go’s internal player as I would’ve expected, and that works fine… So I think I know what’s going on! I’ll send you a private message about hopefully having you use a test track of the app to gather the info needed to confirm. Sure, I don’t mind helping! I wonder if you mind doing a test. Set up a manual test recording that only lasts 2 minutes. Then try to download that with ota2go. Hi Jim - I just tried - seemed to work okay for me on Time Saver download method that I tried, using my original quad. What behaviour are you seeing? Do you see same on longer manual recordings and other short ones? I was wondering if it worked on the Tablo lite cloud recording. I was wondering if file size was bogging something down for @Beaugart. Your app seems to work well for me 99.9% of the time. Ah! No, I think my problematic programming is bogging down the cloud behaviour She’s given me some debug info and we are on the trail of a fix! She’s given me some debug info and we are on the trail of a fix! I am awful at responding. I did try that @jimtablotv , I just forgot to report back that it’s the same behavior no matter how long the recording. It’s kinda neat thinking I could help other cloud storage users use this app in the future. Even if all I’m doing is running the app and sending debug files. If you are anything like me you will love the app once the cloud bug is worked out. Since ota2go will let you use other media players to play the files you can use your favorite. I use MX Player which is my favorite overall Android media player. Then I can play media in the background so I can listen to it and throw my phone in my pocket with the screen off(virtual podcast style). I also prefer the volume controls and the ability to fast forward / rewind with left and right swipes. For some they simply like the fact ota2go opens faster then the Tablo app. Of course the main feature is very nice for us cheapskates that just want to save data or want to play media on devices not even capable of cellular data connections. What more we can play them at higher quality then if we used Tablo connect. It’s also nice for those that don’t want to pay for the Tablo subscription and still want access to their library albeit offline access. @sctaylor got it working on the demo mode! I have my first successful download! Thank-you SO much for your help debugging my code here – it was tedious, and you were an awesome help. What a great community of Tablophiles we have including all of the generous testers in the beginning, and now you to help with the cloud stuff. I’m very grateful! This is great! Been rooting for you all along, so glad you / they got this all figured out and working! When ota2GO rips the recording from the Tablo I assuming it is re-encoding the video to make 1 file since the Tablo records in segments. If Surround Sound is set to On on your Tablo, does it leave the audio untouched as 5.1 AC3 audio? Or does it re-encode the audio to AAC? Hi - there are two modes of downloading: Time Saver, which simply copies segments without reencoding, and Space Saver, which reencodes. The trick tho is that Space Saver (as yet) does NOT support 5.1. Time Saver leaves the audio as 5.1 (but doesn’t shrink the file). Thanks for the quick reply. 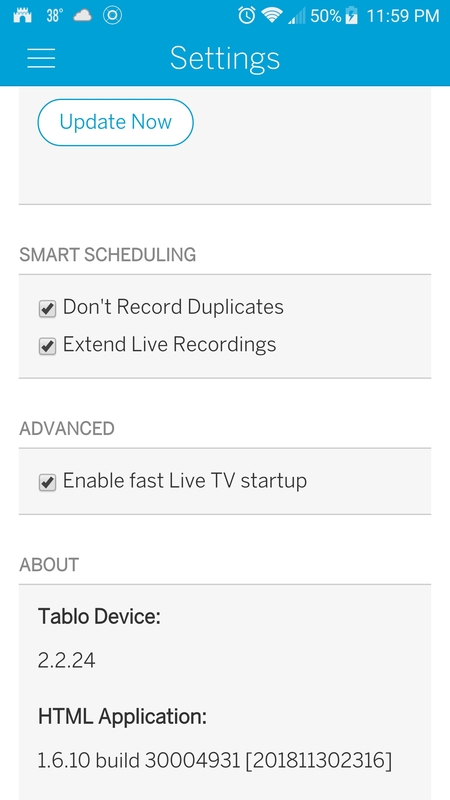 When someone uses the play directly from Tablo option does it stream the 5.1 audio directly to the phone? I only ask cause many Android phones do not support 5.1 audio but the OP in the thread below says the S10 should. 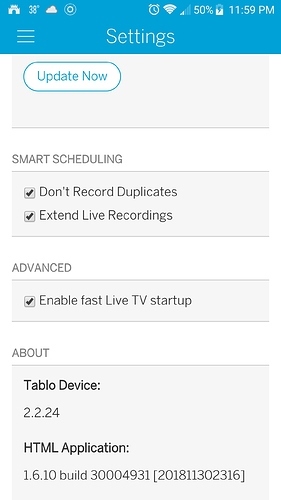 Yes, streaming direct from Tablo to ota2go uses the 5.1 stream. If your phone has a 5.1 codec it will play fine in the built in player. If not, it will show you a quick unsupported message. In that case, you can go in the settings and ask it to promote for an external player for 5.1 recordings. VLC, for example, will play 5.1 even if your phone does not do so natively. Sweet. I’d buy it if there was an iOS version. Any chance of developing / writing one? And of course there are several other brilliant rippers that others have developed - they may work too!